After much deliberation as to what to do and where to go this half term, we have decided to stay in the UK and get cosy in the Cotswolds. The last time we visited this neck of the woods Dougie and I went as a couple as Rory was away skiing with the school. We had a fabulous time at Barnsley House, where, if you remember, there was a huge bath at the bottom of the bed. Now this was all very well for a romantic few days a deux but when you’ve got a 15 year old lad in tow, it doesn’t bear thinking about. So I did some searching on t’internet and I have found this gem, the Old Swan and Minster Mill, a gorgeous inn and country house set in 65 acres of meadows and gardens on the River Windrush. It is owned by the de Savary family and has undergone a multimillion pound refurbishment. It’s not cheap but it is beautiful. The reason it ticks all the boxes for a family break is mainly the fact that it has inter-connecting rooms. I had a bit of a rant about the scarcity of these in a recent post. We have booked two rooms in the more modern Minster Mill block and they have discounted the second room, which is a big bonus. The hotel does seem to understand what makes for a family holiday experience, albeit at the top end of the market. As well as family rooms and connecting rooms, it is dog-friendly (not that we’ve got one!) and has activities available for all ages including nature walks, archery, petting farm, duck races (? ), fishing, table tennis, table football and arts/crafts. We even received a phone call asking if Rory would like to go to the children’s Halloween Party at the hotel during the week we are staying. I declined on his behalf as he would rather stick a hot poker in his eye, quite frankly, but we appreciated the offer nonetheless. Free wi-fi and a great pub menu were of more interest. So, readers, I need some advice as to where to go for days out while we are there. We are sort of equidistant from Cheltenham (Dougie and I visited there last time), Cirencester and Oxford. I’d love a day in Oxford but, being a Cambridge girl, am a bit clueless as to what will be of interest for all of us. One good thing is that Rory now enjoys shopping (hoorah) and we’ve pencilled in a trip to Bicester Village for some discount bargain-hunting. Let me know if you have any suggestions and, while you’re at it, tell me where you’re off to, if at all, with the kids this half term. I hear you about the interconnecting rooms, they were a must when the kids were little. I was going to say I tend to buy the teens their own room interconnecting or not, and then I remembered that I haven't actually taken the family away together to a hotel since my Englishman and I got together. We did camping a couple of times but found the lack of privacy disappointing. My Son recently went to a Wolf Farm in Berkshire, or is that too far away to be of interest? @Vegemitevix – When there aren't connecting rooms then Rory does have his own but it's not the same for an only child, and I'm forever standing in corridors, knocking on the door in my nightie (funny place to have a door…boom boom) to wake him up! Wolf Farm – could be good – will google as I suspect Berkshire a bit too far away, though not impossible. I am deeply envious as my half term will probably be spent clearing out the garage! I'm off to that part of the world next week, and Cheltenham is lovely even on return visits. The Hotel looks great, and I am glad you didn't book Rory into the Halloween festivities…he just joins you in the bar now surely? We are off to Seville and Granada at half term so I'm looking forward to that, and then Krakov in November…aren't we all lucky people? (sorry CQ)! @Libby – Can you imagine if I'd booked him in, just to see his face haha! Yes, a pie and a pint (shandy?) will do him just fine. Seville and Granada have popped up on our list of places we would like to go – let me know what they are like. Oh and Kravok too. Very exciting, Libby. Good choice – it's a wonderful part of the world. Can personally recommend Moreton-in-the-Marsh, Stowe-on-the-Wold and Bourton-on-the-Water. All places we frequent frequently (doh) as a family. Lots to see and do and lots of great places to eat (and some fabulous ice cream)! Sounds a lovely holiday. I can't recommend anywhere though, I'm afraid. My boys will be going off at Toussaint to see their dad, so I may do some motorbiking, depending on the weather and if I'm allowed time off from work. @Steve – Ah, now I remember we did the last two hyphenated towns the last time and loved them – the gorgeous river in BOTW and I bought a fab sweater in SOTW! May need to try MITM this time, plus take Rory back to BOTW which really was lovely. @Emma – Of course, there'll be a Mum's Gone to the Cotswolds raring to go! @Sarah – I remember reading of your motorbike trips: hope you get some time off work so you can visit some other places for me! Bicester! Even I've heard of Bicester! Deeply jealous, as , like Curry Queen, it looks like I'll be home doing Important House Stuff. @Macy – Yeah, decent discount shopping! Will be thinking of you doing Important House Stuff…which we'll have to do when we come back! I am Very Jealous. Years ago my mother introduced me to a series of books written about 2 imaginary villages in the Cotswolds, and it's one of the places I've always wanted to go. Granted, the books were written just post WWII and are entirely peaceful – just a lot of people drinking tea, taking long walks,discussing Jumble Sales and occasionally squabbling about repairs to the vicarage, but so lovely and tranquil, especially in a world full of AIDS and nuclear proliferation and tsunamis and the like. I read them before bed and they're as good as a tranquilizer…at the moment, I'm in the midst of planning our Christmas trip to Phuket and it's making me insane. Oh, and – obviously – I have no suggestions for your visit to the Cotswolds, except I think the name 'Chipping Norton' is absolutely fabulous. No idea if it's worth a visit, though. @MsCaroline – from previous visits to this area, I can vouch for the fact that many of the sleepy villages are unchanged, with gorgeous stone houses. It really is a beautiful part of the country. Chpping Norton is quite close to where we're staying – may look it up to see if it's worth a visit. @Sarah – Have just had a look at your link! Not quite the idyllic peaceful image of Chipping Norton that Ms Caroline has in mind. 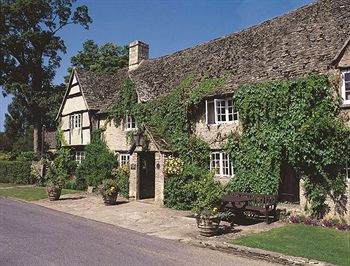 just googled your destination – and delighted to learn that the Old Swan at Minster Lovell is back in the hospitality business and no longer a corporate conference center! We ate at the Old Swan, wandered around the teensy (then) village where 2 roads didn't cross, wondered about the sad end of Sir Francis, and slept in a room over the kitchen when we were kids. The next day we drove over lovely twisting country roads with no particular destination in mind, although Himself and I were, um, surprised to learn that Adverse Camber is not a village. I stayed in the Cotswolds twice and enjoyed it very much! So picturesque. It was quite a while ago, though, so I cannot really help with tips. As for me, I will be flying to Toronto to visit my goddaughter for the first time, very excited! @wellfedfred – What a coincidence! I did hear that it used to be a conference centre. I think it still does have conference rooms but the overall look is now much more posh pub. Still laughing at Adverse Camber! @Funky – Another fan of the Cotswolds! It's a very pretty spot. Now I loved Toronto – I'm sure there's a couple of posts about it under my 'Canada' section if you want to peruse. If you get to Niagara Falls, just look towards the water and ignore the hideous theme park type environment behind you!